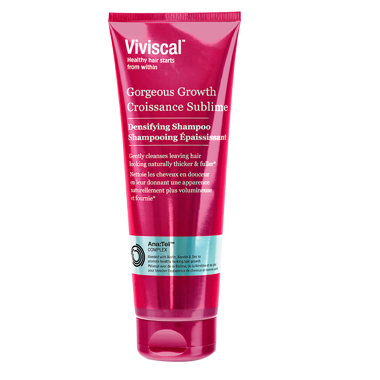 Viviscal Gorgeous Growth Densifying Shampoo gently cleanses the hair and scalp, leaving your hair looking fuller and thicker. The botanical fragrance leaves hair infused with a refreshing scent that lasts. Viviscal Densifying Shampoo promotes gorgeous hair as part of the complete Viviscal Gorgeous Growth Densifying collection. Only the Viviscal Gorgeous Growth Densifying collection contains Ana:Tel™, a proprietary complex that includes clinically tested ingredients derived from natural sources, such as pea sprouts and grape seeds. Combined with Biotin, Keratin and Zinc, the Gorgeous Growth Densifying collection promotes the appearance of healthy looking hair growth. Bought shampoo, conditionner and serum $85.00 a complete waste of money. My hair was tangled badly no matter how gentle I shampooed. I had dreadlocks without wanting them. Pantene spray detangler was used to help me. Lots of hair lost due to these products. Huge waste of money- loss of too much hair. I have been using this shampoo for 5 weeks now and my hair has not been so healthy in years! Growing, soft and shiny. Amazing as I have wild curly hair and it tends to dry out. Not anymore! Thanks again for such great products and service Well.ca!!!! Noticed definite growth and fuller hair, paired with the conditioner also. Great product!